I recently found a picture contest on Photobucket, a website where people dump their pictures. 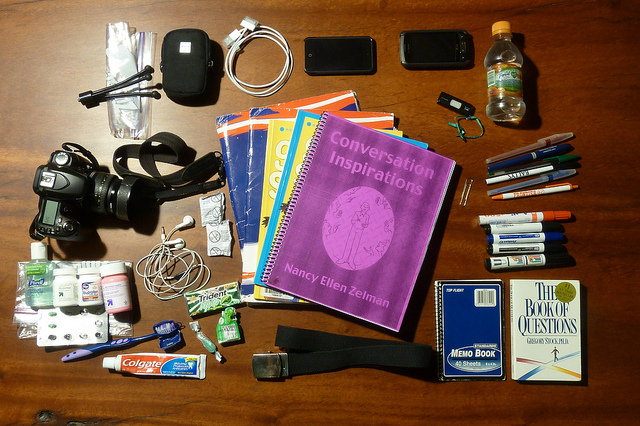 The contest had expired, but I liked the topic: “What’s in your purse?” The winning photo can be seen by following this link, but the premise of the photos are simple: arrange all the stuff you’ve got in your bag for a picture. So, I decided to do it for a Picture of the Day about a month ago. I’d meant write a blog post commenting about it, but I never had the time… until BLOGTOBERFEST, that is! If you’re some kind of a creep or something, you can check out a larger version here. 1. 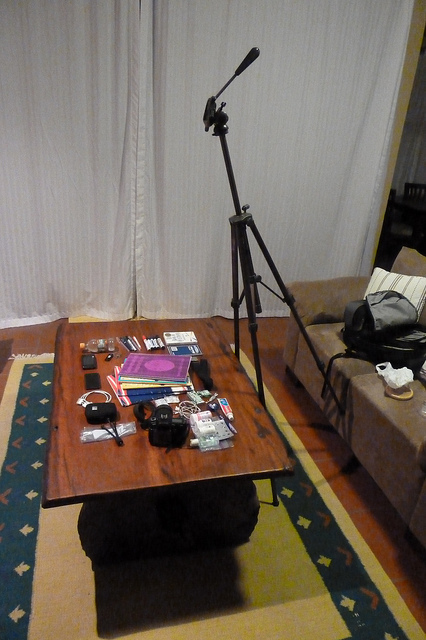 Mini tripod, small camera, regular camera, and plastic bag: Because you never know when you’ll find a Picture of the Day, and the plastic bag is because you never know where you’ll find mold in this Godforsaken country. 2. Ipod and charging cable: Because music is important. 3. Cell phone: I should probably also have a charger for this, since it’s usually dead. I think there’s one in my car, but in any case, it’s really only for emergencies. 4. Flash drive: That’s how things get done around here. 5. Re-filled bottle of water: Small enough to carry easily and look cheap. 6. Folders and books: I do teach, after all. 7. Paperclip: Like free-range prairie dogs, they seem to be ubiquitous in my bag unless I’m trying to find one, in which case there’s not a single one to be found. 8. Pens and whiteboard markers: More tools of the trade. 9. Two of those little “do not eat this” packets: I think they’re supposedly made to keep moisture out of packages, and I’m crossing my fingers that they’ll do the same for my bag. 11. Medicines: Hand sanitizer (the water goes out here more than you’d imagine), generic “anti-diarrheal,” “pink bismuth,” “ibuprofen,” and “gas relief” pills (to counteract traveling classes or horrible food). 13. Gum, mint, and more gum: For when the water goes out and I can’t brush my teeth. 14. Belt: I have no idea how I manage to forget a belt so often–maybe I don’t think I’ll need one when I get dressed, and my pants stretch out throughout the day?–but it’s good to have one on hand. 15. Mini-notebook: Old school solution for carrying phone numbers, and allows me to avoid learning how to program numbers into my phone. 16. The Book of Questions: For use when I need a fast warm-up in class. …which made it by far the most complicated Picture of the Day I’ve shot in these nearly two years. So, that’s it for now, but stay tuned for more Blogtoberfest fun, coming soon to a Sitzblog near you! 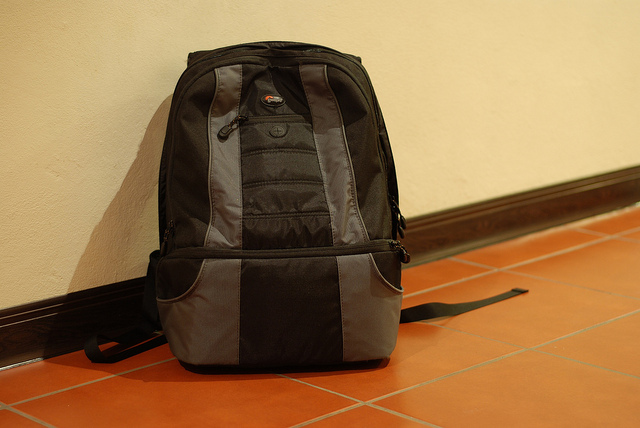 This entry was posted in Bag, Blogtoberfest, Flickr, Photo, Picture, Pictures by Sitzman. Bookmark the permalink.